The following narrative is based on public records, including recordings of HISD board meetings and HISD emails obtained from public information requests. The thousands of pages of emails we received from HISD are primarily with HSPVA Friends and HISD school staff, parents, alumni, and trustees. We have included a number of the actual emails within the story below as files you can open as you read. Be sure to scroll down, as some are multipage documents. To explain how Kinder Foundation successfully grabbed the name of Houston’s beloved and most nationally recognized public high school in six days, you only need to know two words: secrecy and surprise. In December 2015, after many months of stakeholders, project management and construction companies, all working together, the design of the new HSPVA campus was finalized. The original design included a beautiful new building downtown with multiple theaters, studios and performance spaces and high-end theater equipment to make the most of the new spaces. The original construction budget of $80.2 million was funded by a 2012 bond election. An additional $8.4 million was approved in December 2015 to cover inflation in construction costs. The underground parking garage cost $4 million, funded separately by TIRZ funds. But even with the added funds, the budget was short about $5 million. That meant some disappointing downgrades to the theater equipment and not building out some internal spaces. Unsurprisingly, many were alarmed by the bad news. HSPVA Friends, the non-profit support and alumni organization for the school, planned to raise funds to restore the lost items. Friends had planned to launch a capital campaign, but apparently one very important task had never been done. They had not determined the reward recognition levels—for example, for $10,000 you get recognition on the Friends website, for $25,000 you get a plaque in the lobby, that sort of thing. Number one on the to-do list at the start of a capital campaign, and they had not done it. Some time in mid 2016, Friends received from HISD a breakdown of equipment cut from the design, so they could start fundraising to restore the cuts. HSPVA Friends took the equipment list to their largest deep pockets donor, the Kinder Foundation, meeting with them initially on July 12, 2016, and for the second time nine days later. Nancy and Richard Kinder, through their foundation, had been donating $50,000 per year to Friends since 2008. Months later, at an open HISD Board meeting on October 10, 2016, Bob Boblitt, the chairman of the board of HSPVA Friends, told trustees that Friends initially asked Kinder for the “lead gift” in the $10 million capital campaign. A figure of 60%, or $6 million, was discussed. But, he continued, at Friends’ second meeting with Kinder, Kinder surprised HSPVA Friends. Now, instead of the $6 million originally discussed, Kinder wanted to give more—$7.5 million to be exact, and they wanted the school named after them. They had “become aware of the (naming rights) policy,” said Boblitt. The HISD policy he referred to, approved in October 2015, had never been used before (or since). It requires a minimum contribution of $7.5 million for naming rights, whether for a new facility, or the renaming of an existing one, and a majority vote from the nine trustees on the school board. The Kinder Foundation seems to have been surprisingly well-prepared. Since Friends didn’t have the reward recognition levels for the capital campaign set up in advance—according to what Boblitt told trustees—they left themselves open to the sudden co-opting of the reward system by their major donor. Friends acceded to Kinder’s idea to call the school Kinder High School for the Performing and Visual Arts and its requirement that the deal be kept in strictest confidence. No one else would be seeing that equipment list, or be asked to help the school. There would be no competition for the name. Kinder would have the first and only crack at acquiring the name of HSPVA. HISD had never awarded or changed a name for money before. Discussion of the policy when it was adopted in 2015 indicates that it was not intended to put existing schools with established reputations at risk, but it was also loosely written. Since all the discussion was held behind closed doors, people in the community did not know that Friends had put the school’s name in play. No one else—not HISD trustees, parents, alumni, or even other potential benefactors—had a chance to question the deal or suggest a less drastic solution. There was one very important community member who was looped in, however. By August 2016, Friends had secured the support of the HSPVA principal, Scott Allen. He would keep the deal confidential and become an important part of the planning. As Kinder attorneys worked on the contract between Kinder, Friends, and HISD, they consulted trustee Mike Lunceford and HISD’s outside legal counsel, David Thompson, who reviewed the contract in late August 2016. Thompson billed HISD for his review to ensure Kinder’s contract was compliant with the naming rights policy. According to discussion about his involvement at that same October 10, 2016 board meeting (he was not present at this meeting to clarify it himself), Thompson did not negotiate for HISD. No one did. HISD had no representation in the negotiations or writing of the contract. Both Boblitt and Lunceford emphasized that Thompson's role was limited. What they did not mention was that he lacked the authority to negotiate and had a conflict of interest. David Thompson is no stranger to HSPVA Friends. He is a regular and significant donor, he served on the host committee for the 2017 Annual Luncheon, and his wife is the on the advisory board of HSPVA Friends. Trustee Lunceford’s district includes HSPVA. He would later bring the contract forward and place it on the agenda, at the last minute, for the October 2016 meeting. Both Thompson and Lunceford were extremely familiar with the naming rights policy. They wrote it. Or should we say, HSPVA Friends wrote the naming rights policy, for the Kinders. A year before the name sale, Lunceford proposed adding a naming rights policy to some other policy changes under consideration that had been prompted by concern about schools named after Confederate figures. Lunceford’s friend Jean Brackendorff was on the board of HSPVA Friends. He sent her a link to the entire, confidential, unpublished board agenda (135 pages), including the draft of the policy. “Look it over and let me know what changes you would like,” he emailed her. “Thank you so much for the advance copy,” Brackendorff replied. ​Within a few days he had his answer, a bullet-point list that included three important elements. Charitable organizations could market names belonging to HISD. Whole schools, or at least “the campus overall” could be up for sale. The charitable organization should have some control over the spending of the proceeds from the sale of the name. ​A policy explicitly stating these objectives would have raised serious red flags, so Lunceford and Thompson wrote an extremely vague, wide-open policy that simply did not prohibit any of this. HSPVA Friends is a tiny organization. At the time of the naming rights sale for $7.5 million, their total annual revenues had never exceeded about $880,000. Their largest donor was the Kinder Foundation, who had given $50,000 annually for several years. They had only one deep-pockets donor capable or likely to give them multiple millions. They surely had the Kinders in mind when Brackendorff sent her successful wish list to her insider friends writing policy at HISD. Other trustees don’t appear to have ever known what they were approving. Just days before approving the final policy, trustees joked around about large donations, but ended by seriously declaring, “you can’t buy a [school] name with $20 million” and specifying the policy would only allow parts of schools to be named. Unhelpfully, neither Lunceford nor Thompson was at that meeting to clarify this for their fellow administrators. Having successfully deflected any unwanted attention throughout September, Friends was now aiming for the HISD board to swiftly approve the Kinder naming rights contract at the regular meeting Thursday, October 13, 2016. They had worked with Lunceford, who got the item on the agenda at the latest possible moment, on the Friday before, October 7, 2016. The contract itself had just been delivered to HISD the day before that, with two signatures dated October 6, 2016, from Kinder and Friends, and a blank space for HISD’s representative. Interestingly, the head of HISD’s inside legal team, Elneita Hutchins-Taylor, said she had never even seen the contract before it was submitted to HISD for signature. Only attorney David Thompson and Trustee Lunceford appear to have had access to the $7.5 million contract suddenly selling the naming rights to the district’s flagship performing arts high school. In the meantime, those in the know had their own task lists to complete. Principal Allen and the Executive Director of HSPVA Friends, Alene Haehl Coggin, prepared to tell HSPVA school staff of the name change midday Friday. The script they wrote for informing the staff describes Friends’ fundraising in rather heroic terms and strongly emphasizes that the staff must keep quiet until the 5:30 PM public announcement later that day. Elmore’s PR plan had a lot of things happening at around 5:30 PM that Friday night, October 7th. The agenda for the October 13th meeting (the following Thursday) was posted online on the HISD website. Her press release, embargoed until 5:30 PM on Friday, was sent out to major media to publicize the “extraordinary gift.” It briefly mentions the name change. Elmore had arranged for the Houston Chronicle’s entertainment reporter to write a story based largely on that press release. The story and the press release were embargoed until 5:30 PM. All these public notices hit at about the same time, after people had gone home for the weekend, and at the lowest point in any news week. ​Why all the secrecy and embargoing and managing? The last-minute agenda addition and concurrent announcement were timed to allow the minimum time for public discussion. There would be many unhappy people—HSPVA has a large and devoted alumni following and is well known in the community. Given enough time, unhappy people might find each other and mount an opposition. The voting meeting was a mere six days after the announcement. That was not sufficient time for an opposition to form. Activity, most of it still out of public view, continued throughout the weekend. Saturday morning Elmore, Coggin, and Boblitt were preparing the outreach to the trustees. Elmore felt a phone call was more personal than an email and came up with a script for those calls. Trustees Jolanda Jones and Diana Dávila would later describe having first heard from HSPVA Friends with these weekend calls, asking “if they had any questions.” They said they were disgusted to have been looped out and surprised by the announcement. Those two calls didn’t go so well. Plans were made to take Trustee Wanda Adams to lunch Monday at The Grove restaurant downtown. One team member advised the others that Adams could "be slippery and change," and to "work for a firm commitment." Referencing the universal right of free speech seems a rather weak argument to minimize the name change. Students, parents, and alumni can call it whatever they want, HSPVA or Kinder, but the diplomas and the building would say Kinder in January 2019, when the school would move into the new downtown campus. While considering the wording of the letter to parents, Allen mused in an email with the Friends PR team that they might start calling the school Kinder during the academic year before the move into the new building. But some parents were not cool with the idea of their 2018 grads’ diplomas bearing the name Kinder. “I’m hearing from parents with students in the Class of 2018 who are concerned it will say Kinder on their diplomas,” wrote Coggin in an email to Allen. Indeed, the name Kinder means more than one thing. One parent left out of the specially emailed group expressed disgust at having to hear about the deal through a forwarded email, saying “News of an HISD school being named after a corporate sponsor is distressing enough without having to learn this secondhand from people around me.” ​He is not the only one who viewed the Kinder name as synonymous with Kinder Morgan, Inc., the pipeline company founded by Richard Kinder. Others would point out the risks to the district of associating itself with a particular company and industry. The word “Kinder” references the family, the foundation, and Kinder Morgan, Inc. Even if this is not the intent of the school name, it’s unavoidable. The new school name is a three-way promotion for Kinder. In addition to the special 130 families emailed on Saturday morning, Allen and Coggin would continue to contact people individually throughout the next six days, asking them to email the board and speak at the meeting, providing helpful links and forms for registering to speak. A few days after his and Coggin’s Friday announcement, Allen followed up with an email to the 65 school staff and consultants reporting to him, requesting they email the board and speak at the meeting. He provided all HISD trustee email addresses and talking points. Some of the staff also recruited parents and students to speak. Had the transaction in question been a purchase from a vendor, Allen would have been precluded by HISD ethics rule “CAA(Local)” from speaking either for or against. In supporting this “gift” to his school, he used his position, his parent email contacts, and his HISD email account to reach out to a specific portion of the current school community, leaving the rest unaware, in an effort to shape the response to a controversial change. He also enlisted his own staff in the effort. There does not seem to be a written ethics rule addressing this, however. Understandably, Allen wanted to speak out in favor of enhancing the new school. Using HISD resources, cherry-picking student contact information, and enlisting his staff tilted the playing field in a way that should have been off limits. While Allen was letting some people know by email, others found out over the weekend as the news circulated in social media. Elmore’s PR team was watching, and on Monday morning at 9AM sent links to the Friends PR team and Dr. Allen of all negative Facebook posts, singling out Third Ward community leader Gerry Monroe, Trustee Jones, and others. Jones had responded to the news on Friday evening by posting a 13 minute Facebook video of outrage, citing the relative size of the taxpayers’ $90 million investment in the new HSPVA building compared to Kinder’s $7.5 million contribution. Elmore noted that positive Facebook mentions outnumbered negative ones. She would later update the social media report several times. Damage control kicked into gear. Alumni from the original classes in the 1970’s, who helped build the school with a small staff of teachers in an unused synagogue in Midtown, were particularly upset and vocal on Facebook. Some of them received personal calls from Coggin and others, persuading them the name change was critically necessary and not a sellout, but rather, the acquisition of a generous benefactor who would continue to give to HSPVA into the future. The contract commits the Kinders to give nothing beyond the $7.5M. ​Coggin and Allen were also successful in getting beloved educators, both current and retired, to post on Facebook over the next several days. One of these misleadingly minimized the name change (again), saying everyone, including future students, would continue to call the school HSPVA anyway, as though tacking on “Kinder” didn’t really matter. There was a bit of head-patting (“hold your horses and please calm down”) but it seems that even 60-year-old students will quiet down when the right teacher tells them to. It was mostly, if temporarily, effective. With the end of the weekend campaign among Friends and insiders, the school board met for its Agenda Review meeting the following Monday afternoon, October 10, 2016. The discussion lasted two hours, led mostly by Trustee Jones, who declared herself “hotter than fish grease.” She was astounded at the secrecy and the surprise. She, three other trustees and even Superintendent Carranza all said they had no advance warning the school’s name was in play. They had each heard there was a donation deal underway that involved naming the auditorium at HSPVA. No one at the meeting, which included many HISD administrative staff members, seemed to know the source of that misinformation. Jones, who is a lawyer, had questions about the contract. Who negotiated it? Friends and Kinder only. Jones said there was no way she was voting to have HISD sign a contract it had no part in negotiating. That would be attorney malpractice, she said. She described several naming rights sales at the University of Houston, all for much more money and all for the naming of facilities, not the institution. Who at HISD knew about the name change besides Trustee Lunceford? Trustees spent a lot of time questioning HISD staff present at the meeting and never got to the bottom of that. Three other trustees, Rhonda Skillern-Jones, Wanda Adams, and Diana Dávila, expressed distaste at the secrecy and surprise, speaking at length. Now both the ranking lawyers in the room, Jones and Hutchins-Taylor, were hating on how this contract got here. Red flags were raining down. It appeared that HSPVA Friends had not secured support and counted heads before pushing for the vote. Number one on the to-do list for any legislative proposal, and they had not done it. But they did have some in their column. Trustee Anna Eastman, who was absent from the Monday Agenda Review meeting due to a death in the family, had already decided to support the name change by the Friday evening of the announcement, according to her Facebook page, where she posted a link to the announcement and commented “I’m 100% ok with it, honored and excited.” Trustee Harvin Moore expressed support at the Monday agenda review meeting, and ignored the issues of surprise and misdirection, though he briefly said he had not known about the deal ahead of anyone else. Lunceford appeared to have lined up at least these two votes in addition to his own. He needed six. Lunceford also needed the brand-new Superintendent Richard Carranza not to stand in his way. The superintendent doesn’t vote, but his opinion matters a lot. Carranza was put in a terrible position. Not knowing the political landscape of Houston, he would be especially loathe to turn down money from the city’s richest couple, even with some really long strings attached. Whatever he may have done behind the scenes, he never publicly said a word against the deal. By Monday morning, the Friends team had already assumed they nearly had his support. Dianne Johnson, a former trustee helping Friends to manage the board, emailed to the team, “We really need Carranza to lean on Diana and Manuel,” referring to Trustees Dávila and Rodriguez. Trustees Wanda Adams and Rhonda Skillern-Jones had established track records when it came to renaming schools. “Dignity comes before dollars” was Skillern-Jones’ catch phrase during the contentious months earlier in 2016 when HISD, at considerable cost, renamed eight schools originally named for Confederate figures. Adams’ and Skillern-Jones’ approval of the Kinder contract was far from certain. The proposal’s fate looked questionable Monday night, if not doomed, and for good reason. The few opponents who managed to make their voices heard wanted Kinder to take a theater name. Bob Boblitt implied during the Agenda Review meeting that such a reasonable idea had never even been discussed. The Friends group at that meeting were directly asked whether a theater name had ever been on the table in their discussions with Kinder. They responded only that the theater already had a name. Which theater? The trustees didn’t ask this question but there are three in the new school, two in the current school, and only one named theater among all of them. The main theater on the current campus is named for the school’s founder, Ruth Denney. Friends’ answer seemed to dodge the question. If naming a theater did come up in discussions with Kinder, Friends was not volunteering that information. In fact, Kinder would tell the Board three days later on the day of the voting meeting that they would not accept just a theater: no school name, no money. But that’s getting ahead of the story. Meanwhile, the pressure continued. For the next few days, HSPVA Friends, Principal Allen, and school staff worked to get people to email the board, post on Facebook, and register to speak at the meeting. One aim was to create the perception that the whole school community was behind the idea and welcomed the name change. Trustees, parents, alumni and others were chiming in as best they could, but how did current HSPVA students receive the news of the renaming? There were a cantankerous few who weren’t going along. Some current students appeared to have been planning a revolt at the school board meeting, but that must have been quashed, because it didn’t happen. ​Meanwhile, Eastman appeared to be helping the Friends team by forwarding at least one negative letter to them, so they could control the spin. An HSPVA parent questioned the name change with a well-written email that got the attention of several trustees. To this citizen, assuming she had not seen (and downloaded) Eastman’s own enthusiastic “100% ok with this” Facebook post three days before, Eastman emailed “Thank you for your thoughtful letter. (I had a death in the family) so I'm not 100% in…I am conflicted, but know HISD and HSPVA need the money. We need to clarify these things.” That was at 9:44 AM Monday. But at 9:36 AM Eastman had already forwarded the parent’s letter, without comment, to Dianne Johnson, the former board trustee helping HSPVA Friends manage the board vote. 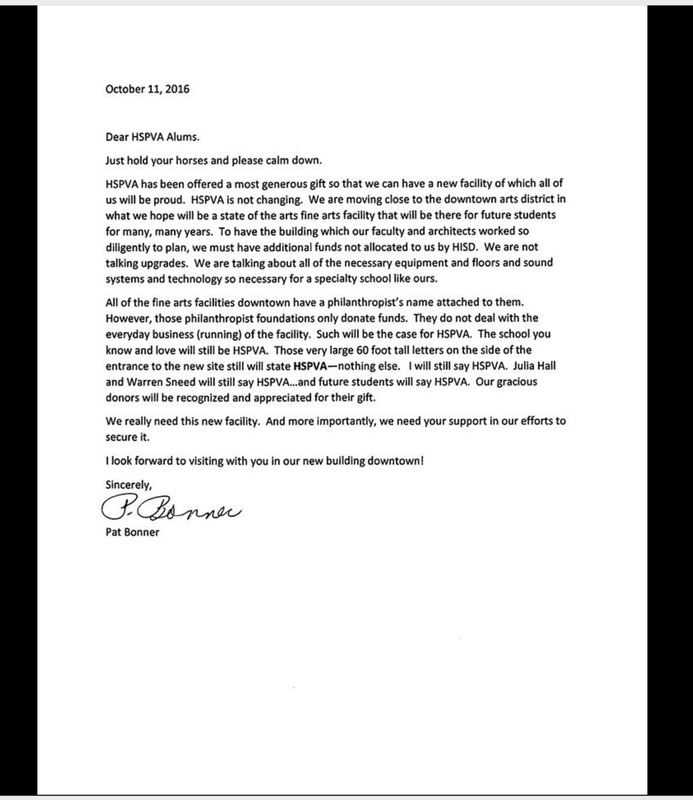 It appears that until that citizen letter reached them, the HSPVA Friends team had not even considered whether people in the community had a stake in the name of the school where they and their children attended, and that their tax dollars will continue to support, regardless of the name. Money seemed to have had a numbing effect on the team. Pressure on the trustees intensified after the Monday meeting. The argument to the alumni as well as the trustees was, don’t scare away free money. Private funding by donation is a brand-new source of money for HISD. Be nice and be gracious to the people with money, so they and other people with money will give more money. If you are not appropriately gracious, none of the them will ever give HISD any money. As Trustee Jones had noted on Monday, though, naming rights are a game changer. Universities and museums don’t sell their own names and they don’t get a mere 8% or less of the cost of the facility for granting even those names. The “don’t scare them away” argument was flawed, but serviceable. Trustee Jones, an attorney, may have also noticed that the contract said nothing about future support from Kinder Foundation. The intimation made by HSPVA Friends to some alumni and parents that Kinder would become a permanent patron of HSPVA was nowhere in the contract. If there were any such commitment, Kinder did not put it in writing. Under the contract, Kinder purchases the name of HSPVA “in perpetuity” (forever) and will have the right to put the Kinder name on everything from the illuminated sign on the school building downtown to diplomas, show tickets, and social media handles and announcements. Contrary to those Facebook posts that minimized the name Kinder, the change in identity was intended to be pervasive. There is no “morals clause,” a standard clause that would have allowed the District to remove the Kinder name if ever the name fell into disfavor or disgrace. (Think Enron Field, now Minute Maid Park.) The perpetual term goes beyond the life of the new building, applying even if the school were rebuilt in another location, referred to as "future campuses" in the contract. It’s a three-party contract between Kinder Foundation, HSPVA Friends, and HISD. HSPVA Friends is the middleman in the contract, acting as a pass-through entity for the money between Kinder and HISD. Although they don’t profit directly from the contract, their website credits their own capital campaign with the $7.5 million “gift,” an impressive claim for a small non-profit whose 2016 total contributions were $883,000. Proximity to money and relationships with major donors are extremely important in the non-profit industry. Friends had a glaring conflict of interest in promoting the deal to HISD and via Principal Allen, the school community. Media never even noticed. How does HISD get paid? Not all at once. It will take until as late as 2029 for the last of the funding to reach HISD. The contract grants Kinder control over spending of the $7.5 million throughout. There is a requisition process in which HISD must ask Kinder and Friends for every penny, justifying one expenditure, or one group of expenditures, at a time. Each transfer of funds to HISD must be approved by Kinder. This is the same $7.5 million Friends constantly referred to as a "gift” from Kinder to HISD. All these details were worthy of much discussion before the vote, but citizens didn’t know any of this. The contract was not released for public review until after the vote. At least one parent who called HISD was told it could not be provided because it was not yet a “signed” contract. The Houston Chronicle requested it on Thursday, the day of the vote. The Chronicle did get the contract and posted it online, notifying the public through a Twitter feed during the voting meeting Thursday night. Had citizens known what was in the contract, the pushback might have been more forceful. Principal Allen, HSPVA Friends, and school staff set up a series of lies to keep people, particularly students and alumni, from objecting. The most effective was this: "The Kinders are aware that we will not be KHSPVA, always HSPVA. Use Kinder in the formal name." The implied "only" in formal usage was an adept omission. The Kinder contract called for comprehensive use of the new name on the building, official documents (diplomas, transcripts), new logo, social media, and any publicity announcements. It left no stone unturned. Even the "persons operating the school"--teachers--are required to say "Kinder." But Allen, Coggin, and school staff encouraged the school community to believe the opposite, that "Kinder" would be discretely tucked away out of sight, or as one student told another "only on legal documents." Another lie was that the naming rights policy flatly offers school names for a $7.5M fee to anyone who steps up. He omitted that the amount is named in the policy as a minimum, and that it takes a board vote, presumably allowing for at least some community input. He was not above lopping $8M off the budget either, citing it erroneously as $80M when he must surely have been aware it was increased to $88M. He was also aware of the additional $4M for the parking garage, since he had lobbied hard to get it. Coggin said that the school would be nearly useless without the Kinders' money. She would later echo these "parent talking points" in her comments before the board. "Without this gift HSPVA students will not be able to receive an adequate arts education. The bond money, as generous as it is, will only provide a high school, not a high school for the performing and visual arts," she would tell the board. Her parent-teacher talking points took this further: "If there is no gift, there will be no arts features. Imagine no practice rooms, nowhere for the orchestra to sit in the theater, nowhere to make sets, to paint, to sculpt, to make art." The Kinder contract provides $275,840 for an orchestra pit lift—not the pit itself. The contract specifies nothing for the Visual Art department to outfit the art studios being built by taxpayers, where students will paint, sculpt and make art. HISD art studio equipment would be at least as good as at the current school. The $88M budget includes three theaters and a recital hall; separate practice rooms for orchestra, mariachi, choir, ensemble, band, harp, and jazz; three dance studios convertible to performance spaces; a scene shop, costume shop and lighting lab; an art gallery, six art studios plus separate rooms for printmaking and digital printmaking; and 24 academic classrooms. Coggin's contention that HISD was building a regular high school not fit for a fine arts curriculum is beyond exaggeration or spinning. It's just lying. She could have stuck to the truth—the Kinder funds would significantly enhance the school. Apparently, she felt that was not enough. But the name change forces continued to wield influence with the school board. Trustee Meyer received an email from a wealthy business associate of Richard Kinder, Doug Foshee, combining both a get-back-to-town message with the threat of loss of private funds: “hoping that you can make arrangements to be there and vote for the Kinders’ commitment to HSPVA. This is not only critical for HSPVA, but for the future of the philanthropic community’s willingness to provide extraordinary help to HISD. I understand that you have a schedule conflict, but hoping that this can be resolved for this most important issue.” He copied four other important people, including an energy executive appointed to the Texas Public Finance Authority by Governor Abbott. Foshee has subsequently formed a group called Houstonians for Great Public Schools with those he copied on the email. Houston GPS seeks to influence school board elections with endorsements. Their board is loaded with charter school representatives, a strong indicator they are part of the push toward privatization of public school systems. Kinder Foundation donates to Foshee's organization and a similar one called Leadership ISD. A year later, in the fall of 2017, the Kinders would show up on campaign finance reports of five trustee candidates (three of whom won) donating in $2,000 chunks. Houston GPS PAC would appear with $10,000 donations on six candidate reports. As the privatization movement goes nationwide, Houston ISD, eighth largest in the nation, is a target. The Kinders are supporting privatization. ​Clearly, as the contract neared its vote, there were some powerful people with eyes on the situation. During the fiery Monday Agenda Review meeting, the board seemed to separate into two camps. As they had done months before in the conflict over renaming the schools named originally for Confederate figures from the Civil war, the break appeared to be along racial lines. It was all four of the women of color who questioned the deal at that meeting. The two Anglos present, Lunceford and Moore, were in favor, and based on her very early Facebook posting, Eastman, who is also Anglo, was in already in favor. Meyers, also white and not present at that meeting, would also later vote in favor. It was not a racial issue. The controversy was much centered around the whole idea of naming schools for money—not just stadiums, theaters, or other “facilities”—but the whole identity of a long-established, respected school. Even more aggravating was the way the non-Anglos were looped out and surprised by Lunceford’s last-minute contract attempting to force the board to sign off on an unusual and unprecedented action which, as far as these trustees were concerned, had never even been contemplated before. Monday afternoon, even before the meeting took place, Trustee Harvin Moore emailed Principal Allen, “Having dinner with the Kinders tomorrow night and hope to build confidence that Jolanda (Trustee Jones) is worth ignoring.” He was probably referring to her Friday Facebook video, the one where she took issue for 13 minutes with the Kinders for demanding the school name in exchange for funding less than 10% of that school’s construction. ​Trustee Jones’ objections during the Agenda Review meeting to the Kinder deal were based on fiscal responsibility, the poor contract, the manipulation of process through surprise and secrecy, and the whole idea of awarding whole-school names, not just auditoriums and stadiums, for money. HISD had never sold a name for money before, and the board was not given time to study naming rights. It hadn't offered this school name for sale—the entire transaction was orchestrated from outside by HSPVA Friends the Kinder Foundation. Jones did bring up school equity, her signature issue, pointing out that HISD’s better financed and attended magnet schools will attract this kind of extra funding, worsening the resource gap between them and schools in underserved communities. She mentioned, as she has so many times, specific instances of underbuilt schools in her district. Jones does use the term “rich people” quite a bit, in a non-complimentary way. In his Monday email to Eastman, Moore made the points he would also discuss in the meetings, namely, that HISD can’t expect to get top dollar for its flagship school in a prime location downtown, because “these programs start slow” and institutions like UH have an “established model.” Of course, Moore did not mention that UH doesn’t sell its own name, only its stadiums and buildings. And HISD has only ONE school with a glitzy new campus in a prime downtown location AND a nationally recognized name and reputation. It seems that Trustee Moore, a businessman, believed that HISD should sell its best intellectual property—the name of its 45-year-old, unique, crown-jewel performing arts school—into a test market for the minimum price with no competitive bidding. One wonders, whether he would he deploy his most valuable property as a loss leader. The used car salesman move. My boss says this deal is only good today. People registered to speak were told in the morning by HISD that the item had been pulled from the agenda. The Houston Chronicle called Trustee Rodriguez, Board President, who said it would likely be pulled from the agenda. The Chronicle quoted him: “ ‘With some of the dissension by board members and finding out it wasn't time sensitive, it probably is better to pull the item," Rodriguez told the Houston Chronicle. "We don't want to offend anyone by voting it down.’ "
Moore and Lunceford were quoted as wanting to bring it to a vote immediately. A spokeswoman for Kinder Foundation, making absolutely sure Rodriguez knew the deal was time sensitive, told the Chronicle, “its gift proposal, as is, remains on the table but the agreement does expire today.” Full article here. This was a new and significant development. Kinder Foundation never made any other public comment that we could find before the vote. They surfaced only to say, it’s not a gift, it’s a deal. Take it or leave it. All or nothing. Now or never. Rodriguez made sure the item was on the agenda. Citizens arriving at the meeting that night sat through 39 minutes of recognitions of district employees, students, and others before the board even got down to business. This is not unusual. Trustees Lunceford and Meyers both had arrived from out of town. Trustee Eastman was present despite the death in her immediate family, which had taken her out of town also. Trustee Adams joined by video. No one could hear her, and she appeared to be standing outdoors somewhere. Twenty-nine people in all spoke, 18 in favor and 11 against. But everyone knew when the item finally landed on the agenda, it meant only one thing. The Kinders must have the votes. And they did. The board voted 7 to 2 to take the money and change the school name. Only Trustees Jones and Dávila voted against. Both cited school equity and the lack of transparency about the contract and the entire process. Board members had not been given sufficient time to study the contract before being compelled to vote on it. And THAT’s… how THAT happened.